Are you a massive food enthusiast that wants to share their love for exquisite and interesting food and cuisines? Maybe a cooking expert that wants to share their recipes and techniques with the rest of the world? Perhaps even a master gourmet that wants to do quirky junk/fast food reviews while dressed up in suits. If you thought ‘yes’ to any of these questions, we believe that WordPress food blogging is the right venture for you. But setting up a WordPress blog isn’t exactly a breeze of a task and neither is the case for food blogs. We cannot expect all of your visitors to be technically sound in the field of the CMS and WordPress administration. So we bring you this guide to walk you down the entire process of starting your food blog and clear up confusions regarding it as much as possible. 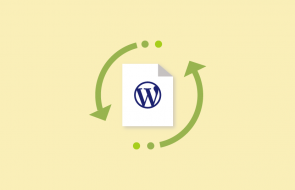 Now you’ll be required to install WordPress on your hosted server. This blog will be a great help to you for this purpose and more. 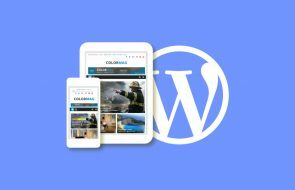 Once your server is ready and you have WordPress installed, you’ll be ready to install your WordPress blog theme. 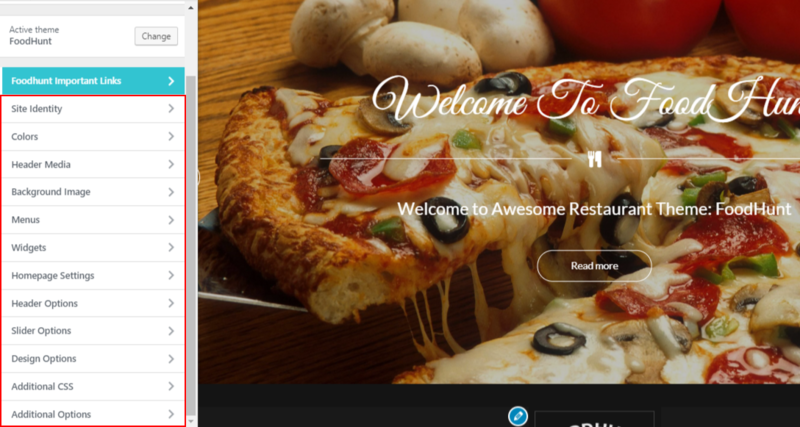 If you need help choosing Food and Restaurant oriented WordPress themes you can check out this article to view some of the choices we personally recommend. 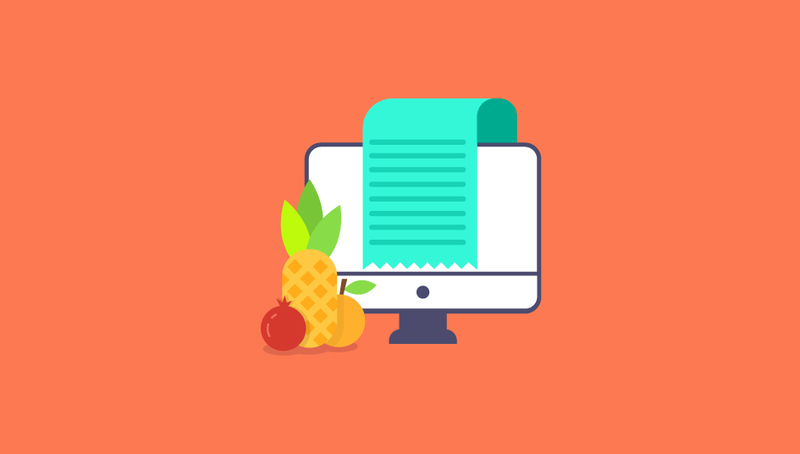 For this tutorial demonstration, we’ll be using FoodHunt, a free theme created by our developer team at ThemeGrill to help you create amazing WordPress blog sites. FoodHunt is a WordPress theme created exclusively for foodie blogs and restaurant marketing. The theme comes with integration with ThemeGrill’s RestaurantPress which helps you advertise your food menu, pricing, ads and more. Easily insert Food items and exquisite menus using the plugin and supplement it with amazing blog posts with the help of FoodHunt’s awesome slider. From highly interactive gallery features to frontend price views for your food ads, you can enable it all RestaurantPress. But that’s not all, FoodHunt is also fully integrated with Demo Importer plugin which lets you instantly import premade demos and layouts for your website with a single click. For further theme customizations, you can choose primary colours, customize logos, menus, background image, headers and more. The theme is completely SEO optimized and comes with Translation ready features as well. Furthermore, the Pro version theme adds upon the myriad of free features with a wide range of Typography options, special recipe showcase section, and fun facts section. 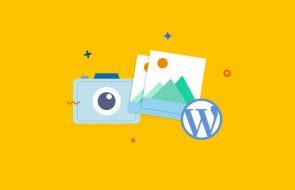 Once you’ve set up your website’s hosting and domain name and installed WordPress on it, you’re ready to start working on, enabling and customizing your awesome WordPress food blog. First, you will have to install FoodHunt. If you aren’t unsure about this step, refer to this great article. Once FoodHunt is installed and activated, you’ll also be notified to install RestaurantPress and Demo importer. You can install these plugins and if you aren’t sure on how to do this, this article will be quite helpful to you. To make your job easier, you can either click on the Begin Installing plugins link on the notice. Or you can hover over Appearance and click on Plugins listing. This will refer you to a page where you can directly install and activate the required plugins. So once you have opened the Install Required Plugins page, click on Install below the plugins listed to install them. Once you’re done installing, go back to the previous page and click on Activate under the plugin again to activate them. Alternatively, you can do this on the Plugins page too as our previously linked guide dictates. The theme lets you easily import a pre-made demo for the free version as well as the pro. Once you have installed the Demo importer, hover over Appearance on the Dashboard and click on Demo Importer. A simple list of instructions will be given to you and you can read it for your convenience. Once you’re done, click on Theme Demos to find available Demos you can use. You can preview these demos by clicking on their thumbnail. In order to install the Demo, hover the free demo and click on the Download button under the preview. To help our viewers understand how the Demo importer plugin works, we’ve created this Video tutorial on ThemeGrill demo importer. 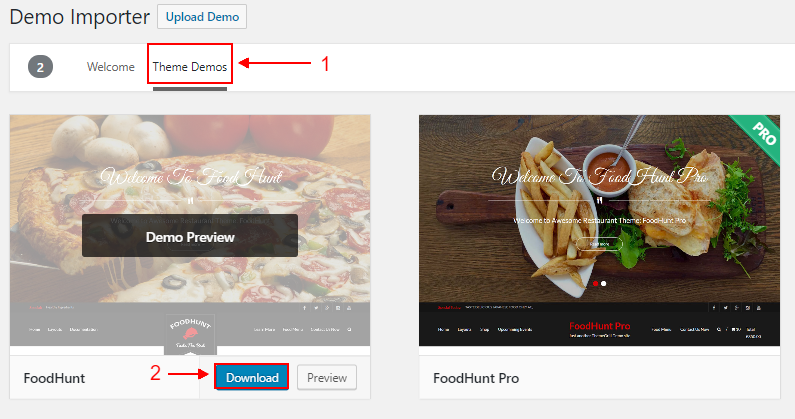 You can use the instructions on this tutorial to install your FoodHunt demo and activate it. In addition, the Demo importer might recommend you to install the Google Maps widget which we highly suggest as well. This can be quite useful if you own a restaurant and want to advertise its location. Once you’re Demo is installed we’re ready to customize the Theme to our heart’s content. You can easily open WordPress’s theme customizer by hovering over Appearance and then clicking on Customize. While this section is an important part of your website design, we believe that it should be representative of your own style and feel. Therefore, we will be only roughly explaining the various options unique to FoodHunt. We highly suggest that you try out all these elements that Foodhunt lets you customize and mess around them to get a better idea about theme customization. This lets you explore various ideas and designs to implement on your food blog. Here you can set or change your website’s logo, set up website Title which can be shown on the header as well as the browser tab alongside a tagline. As an addition, you’re also free to set a site icon/favicon separate from your website’s logo. FoodHunt also lets you set a custom background colour. You can use the good old colour slider to easily select what color and shade you prefer for your website’s background. As an alternative, you can also choose a background image to set for your website. Just keep in mind that your background image should blend well with your text and it’s generally a good idea to keep background image in a single or selective few shades of colour, preferably black or white. Through FoodHunt you can enable amazing headers on your websites. These headers can be dynamic and highly detailed images as well as uploaded videos. Furthermore, you can simply place a YouTube video on your header as well. These header options are further extended to support Header news, sticky headers, header title bars and support for header logo and text. You can enable an attractive slider for your website easily with the Slider options. This highly functions slider allows you to set which page to preview on your slider, showing its Title, starting content and its featured image. You can also customize them to hide/show navigational buttons and left/right arrows. FoodHunt provides you with 4 different menu locations for your customized menus. You can easily insert and reorder items on these highly interactive menus as well as enable an option to add new top level pages to any of these menus. As for widgets, you can enable all sorts of widgets on 4 different sidebar locations on the footer and your ever welcoming default Restaurant Template sidebar. As with menus, you are free to insert all types of widgets in these locations as well as ThemeGrill’s customized widgets which are provided with the theme for free. 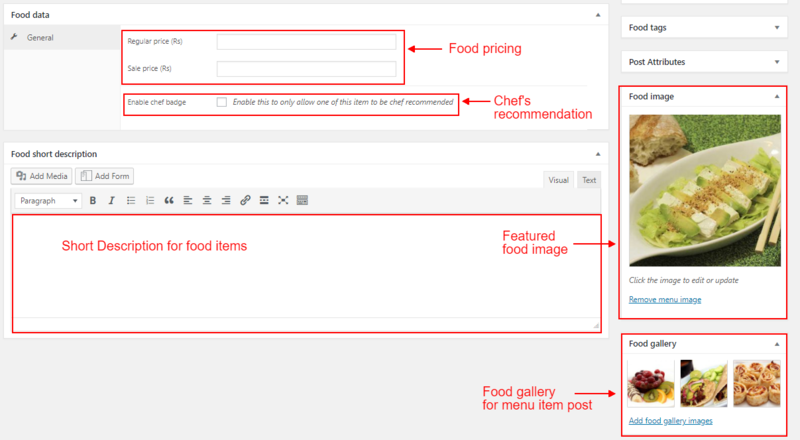 Accompanying FoodHunt is the ThemeGrill exclusive food blog plugin: RestaurantPress. While it provides features which are completely crucial to food blogs it also provides website designers with a few theme settings worth messing around with. This includes a Primary colour option for RestaurantPress related items and listings, Auto image cropping and management for your added food items and more. Using the Menu Items section you can easily add a Food item on your restaurant website and more. The custom post section can have featured food images, specified foot categories, short food descriptions, Pricing with and without a sale as well as Chef badge to show the chef’s recommendation for your foods. You can easily add an accompanying description for your food item and with Everest Form’s integration, you can place an appropriate form, if necessary. To add a menu item, simply click on the Menu Items section on the WordPress Dashboard and click on Add Menu Item. Here, there are many sections you can play around with. 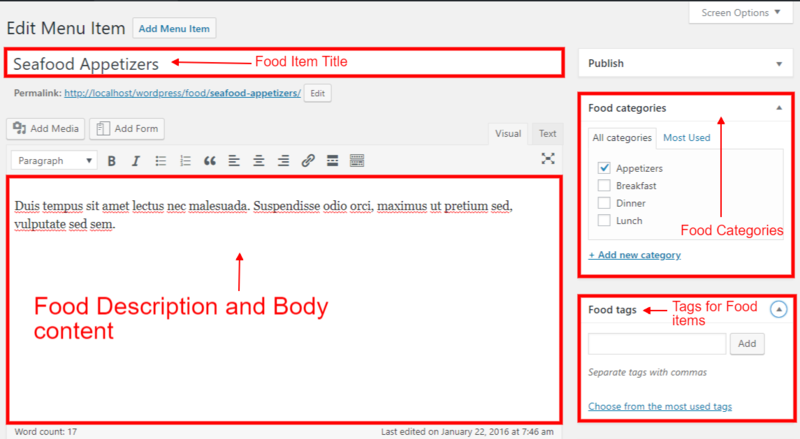 Any content in the main body editor of the post will show the corresponding content directly on the menu item’s post. This can range from simple recipes to food reviews to vlogs about the food and further information regarding it. Using the Food Categories section you can choose which menu group the item falls in. Similar to normal posts you can also enable food tags for your posts as well for well arrangement of your recipes. The Food Data section lets you add appropriate food pricing for your food items, pricing with a sale as well as a Chef badge to show selective chef’s recommendation. You can also place a featured image as well as Food galleries to show one or more than one images displaying the visual appeal of your amazing recipes. Now an important part for Food blogs is to arrange Menu item categories. This will be quite important to help you manage Food items, as well as its integration with RestaurantPress’s menu listings, requires you to setup proper categories. 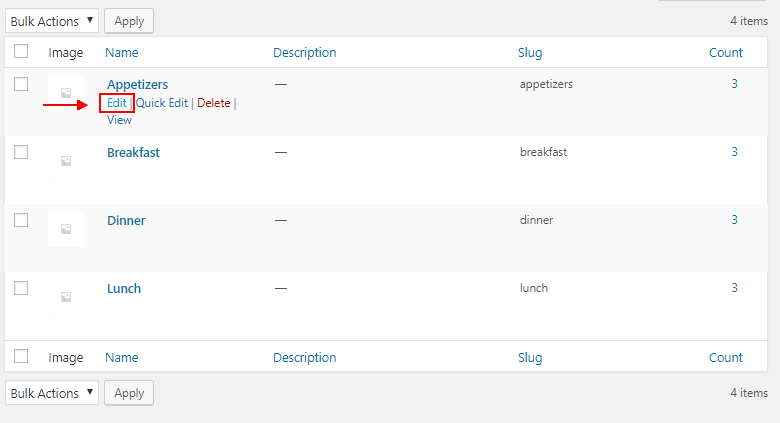 So in order to manage your Menu items’ categories, you will need to click on Categories under the Menu Items section. Here you can create new categories by filling up the right fields. Simply enter the category name, slug, parent category if necessary and enter a description (which isn’t compulsory either.) Furthermore, you are free to enter a category icon by uploading an icon image if you want. You are also free to edit already existing categories on the right by hovering over their names and clicking on Edit. Then you can change their names, website slugs, parent category, category descriptions as well as insert/delete their custom category icons. RestaurantPress is the accompanying free plugin for FoodHunt which was made to help users create amazing menus for restaurants, cafes, hotels and more. Using FoodHunt you can customize and enable Single/Double column layouts as well as Grid layouts for your food and drinks menus. Adding new items on your menus has never been easier! In order to add a new menu, simply click on RestaurantPress’s dashboard listing. Then click on Add Group to add a new menu. Here you can enter the Title for your new food menu as well as enter a short description if necessary. Then you can choose the layout type. You are provided with three options for your menu layouts: One Column, Two columns and Grid layout. You can also choose whether to hide or show the featured image of the menu listings as well as category icon. In order to choose what you can show on the menu, you will have to use the Grouping section on this page. Click on Grouping under Group data to choose what items will be shown on this menu. Here, you are free to enter items through entire menu categories ( which we have discussed above.) Every food item in this category will be shown on your menu. Furthermore, you can combine multiple categories if you want to show a wide range of items on your menus. Now that you’ve customized your menus, you are free to place these menus on appropriate pages and posts. In order to do so, open RestaurantPress’ dashboard page. Then you will need to take note of the Group ID of the group you need to insert. For example, in this demo, we take note of the group named One column for our one column page. The selected Group ID is 359. Then open the page you want to insert the menu in and refer to the Visual editor for your page. Click on RestaurantPress’ Insert food menu button. This should give you a prompt to enter your group ID. For our example, we’ll be entering our group ID which is 359. You’re also free to sort or reorder the items based on different options as well. Click on Ok once you are done and the correct shortcode for your menu will be inserted on the Page/post. This should enable your custom food/restaurant menu that is based on your settings. Thus, in conjunction with RestaurantPress and FoodHunt’s various inbuilt theme features you can enable a pleasing food blog experience or advertise your restaurant’s cooking. We also highly recommend using various other WordPress food plugins in conjunction for maximum benefits for your WordPress food websites. You can check out our recommended list of food and restaurant plugins. Beginner’s Guide To Create a WordPress Helpdesk on Your Website!